As many as twenty-four new species from Australian rainforests are added to the weevil genus Trigonopterus. Museum scientists Dr. Alexander Riedel, State Museum of Natural History Karlsruhe, Germany, and Rene Tanzler, Zoological State Collection Munich, Germany, have first discovered them among unidentified specimens in different beetle collections. The study is published in the open-access journal ZooKeys. Australia is well known for its extensive deserts and savanna habitats. However, a great number of native Australian species are restricted to the wet tropical forests along the east coast of northern Queensland. These forests are also the home of the recent discoveries. 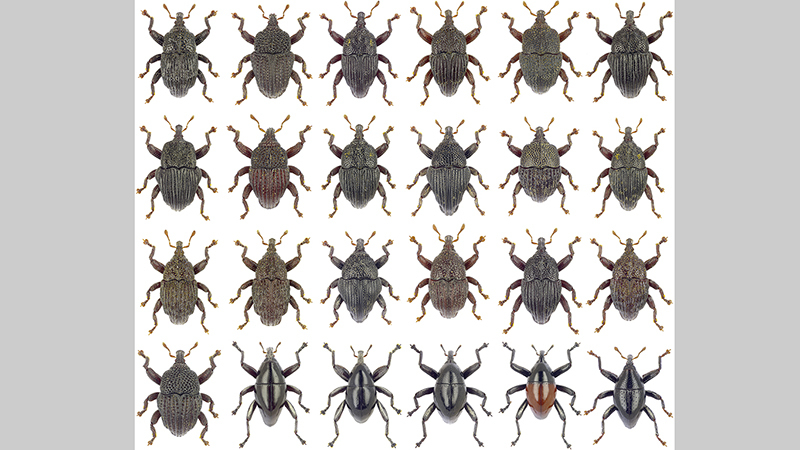 Most of the weevil species now recognised as new have already been collected in the 80s and 90s of the past century. Since then they had been resting in museum collections until German researcher Alexander Riedel had the opportunity to study them. However, old museum specimens alone are not enough either. Nowadays, researchers try to include DNA data in their descriptions, and the necessary sequencing techniques work more efficiently with freshly collected material. Therefore, the scientists set off to the field after they have studied the collections of others. Nevertheless, the German team were led to the discovery of one additional new species, which had never been seen before. They called itTrigonopterus garradungensis after the place where it was found. All of the newly described weevils are restricted to small areas. Some are found only in a single locality. Presumably, this is a consequence of their winglessness, which has prevented them from spreading around. Furthermore, most of them dwell in the leaf litter where they are easily overlooked. Usually, they come to light during specific surveys of the litter fauna. This is what Geoff Monteith from the Queensland Museum in Brisbane, for instance, has done in the past. As a result, his work is now relevant to conservation because highly localised species are extremely vulnerable to changes of their habitat such as climate change or the arrival of invasive species. It is likely that Trigonopterus weevils have originated in Australia, the oldest landmass in the region. The island of New Guinea is geologically much younger, but there the genus has quickly enough diversified into hundreds of species. Studies investigating such evolutionary processes depend on names and clear diagnoses of the species. As a result of the present research, for the Australian fauna these are now available. Besides the publication in the open-access journal ZooKeys, high-resolution photographs of each species are uploaded to the Species ID website, along with the scientific description. All this puts a face to the species name, and therefore is an important prerequisite for future studies on their evolution.